Never mind System of a Down's irresistibly quirky Serj Tankian. If any heavy metal musician were picked to represent the musically adept but incurably goofy spirit of Frank Zappa, it would probably be gifted lunatic Devin Townsend, whose prolific and eclectic output -- not to mention blackened sense of humor -- over the course of a steadily lengthening career continues to amaze and confuse in equal quantities. 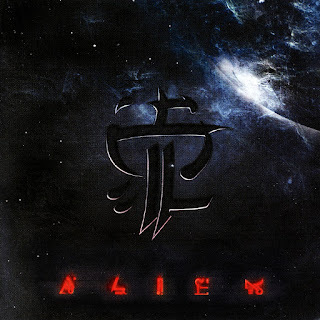 Through those years, Strapping Young Lad, while ostensibly a "group," has served as the most common laboratory for Townsend's wacky solo experiments, but word is, studio album number four, 2005's fittingly named Alien, is their first true band effort. This is somewhat rather hard to ascertain, but there's no disputing the additional claim about the album constituting an exercise in catharsis, nor the fact that few bands choose song titles as descriptive of their contents as SYL. To wit, "Imperial" comprises Scandinavian-flavored black metal of earth-scorching intensity, the nearly unpronounceable "Skeksis" contains a suitably schizophrenic and disorienting art rock-metal cacophony, and "Shitstorm" offers, well, a sh*tstorm of unprecedented madness, rife with giggle-inducing lyrics and a children's choir all crammed inside. Moving right along, lest we be overcome by the oncoming rush, "Love?" delivers intentionally dumb lyrics via chorused harmonies (think King's X from hell), "Shine" channels Fear Factory's nightmarish industrial metal (and explains bassist Byron Stroud's parallel work with that group), the blazing hilarity of "We Ride" thrashes itself into an absolute froth, the riffs of "Possessions" groove like they were played by Dimebag Darrell, and the impossibly gentle "Two Weeks" finally forces the collapse of the entire record, which implodes into its own black hole, taking along with it the plaintive acoustic guitar and whispering sweetness. This is but a brief reprieve, however, as the obscurely named "Thalamus" racks up the volume while introducing the first widespread use of melodic keyboards thus far, the unforgiving "Zen" finally bucks tradition by being anything but, and, in what may constitute the album's only unpardonable fumble, the ironically named "Infodump" is just that: a 12-minute reservoir for mostly useless feedback and static noises. At least if one has made it this far it's become easier to accept those statements about a "band effort," what with former Front Line Assembly guitarist Jed Simon and the aforementioned Stroud lending industrial cred while matching Townsend's guitar flurries throughout, and drumming monolith Gene Hoglan making all the stylistic variations seem absolutely effortless, as usual. Which is to say that Alien is a reliably varied and strange outing for Strapping Young Lad, but its uniquely violent methods may leave fans of the group's kookier side(s) just a little disappointed.